Chair Arm Covers With Ergonomic Memory Foam For Computer Chair Arm Rests (2 per pack). Perfect For Office Computer Arm Chair Pads. THE PERFECT ERGONOMIC ARM PILLOW: Looking for an awesome office gift? This memory foam pad evenly distributes pressure between the elbow and arm while providing cushion for ultimate comfort. It can be easily put on and taken off, and fits any chair arm that is 6-11 inches. Your arms deserve some comfort, let Comfy Guru provide the best comfort for them. QUALITY-TESTED AND APPROVED: Comfy Guru Chair arm cover relieves pressure points in your elbows and arms. Which means if your arms could sleep, they would be in a meditative sleep trance. Each Memory Pad Cover has 1.5 inches of high-density memory foam that way your arms will be able to work hard and chill hard. ALMOST 50%CHEAPER THAN THE COMPETITION: Since these are made with memory foam they normally go for between $33.00-$40.00 without including shipping but we have decided to make this high quality product accessible to everyone. Don't believe me? Go check out everyone else! But since we care more about comfort and customer satisfaction than money, we cut the price by almost 50%!!! COMFY GURU CAN BE WASHED: The Comfy Guru Chair Arm Cover is equipped with a zipper so that you can take out the memory foam and wash the cover. At first glance, one can't find it , but if you flip it inside out you can see a little incision with a zipper. From there, you can take off the cover and throw it into your washing machine for a fresh clean. But don't let your arms wait to long, how would you like to sleep without a pillow! 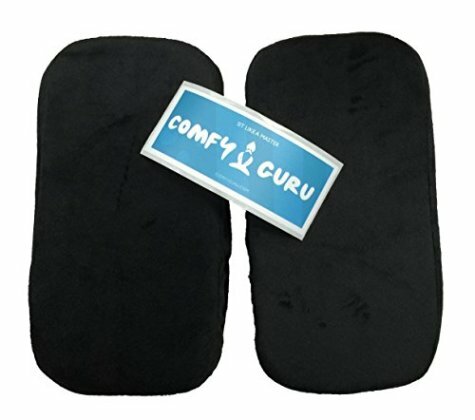 100% MONEY BACK GUARANTEE: We know that Comfy Guru has unique and amazing arm pads and if your not satisfied, no problem. We will send you your money back. As mentioned above, your comfort and relationship are much more important than selling this product.